The federal government has long required election ballots in some U.S. jurisdictions to be printed in languages other than English, based on the number of voting-age citizens who live in those communities and have limited English skills and low education levels. New data from the Census Bureau show that 263 counties, cities and other jurisdictions in 29 states will now be subject to this requirement in future elections, a slight increase from five years ago. The language assistance, required by the federal Voting Rights Act since 1975, applies to places with Asian American, Latino, American Indian and Alaska Native populations that meet certain requirements. The Justice Department, which enforces the law, says the assistance helps more people “be informed voters and participate effectively in our representative democracy.” During the last reauthorization of the Voting Rights Act, in 2006, Congress extended the language assistance provisions to 2032, and they were not affected by a Supreme Court ruling in 2013 that invalidated other sections of the law. The jurisdictions that now must provide non-English ballots and other elections material – which include some communities on tribal lands – encompass 68.8 million voting-age U.S. citizens. That is 31.3% of the total U.S. voting-eligible population of 220 million, which consists of citizens ages 18 and older. The Census Bureau updates the list of jurisdictions every five years, based on American Community Survey data about all voting-age citizens who speak English less than very well and have less than a fifth-grade education. Jurisdictions can be added or removed from the list based on changing resident profiles. The last Census Bureau list, released in 2011, included 248 jurisdictions in 25 states, covering 65.6 million people, or 30.7% of the total U.S. citizen voting-age population in 2010. The previous list, in 2002, included 296 jurisdictions in 30 states. Of the jurisdictions on the new list, many are in Texas (89) and California (27), which also are the states with the largest numbers of immigrants. In eight states, only one jurisdiction must offer non-English ballots (sometimes in more than one language): Georgia, Hawaii, Idaho, Maryland, Nevada, Oklahoma, Utah and Virginia. Three states – California, Florida and Texas – also must provide Spanish translations of any elections material issued statewide. The new list adds language assistance requirements for at least 25 languages in 52 jurisdictions, some of which already had another language requirement in place. The list drops specific requirements in 40 others, though some of these retain other language requirements. All changes are effective immediately. Some localities with new requirements are places with growing foreign-born populations that reflect the increased dispersion of immigrants. In some localities where language assistance requirements were removed, it may be because of a national trend of increased educational attainment among recent immigrants. In others, a factor could be that a rising share of Hispanics are U.S. born, and English proficiency also has risen among Latinos, according to a recent Pew Research Center report. The number of jurisdictions required to offer language assistance account for 3.3% of the counties and towns counted by the Census Bureau. In addition to ballots, jurisdictions also are required to provide language assistance in registration, informational materials, absentee voting and other aspects of the voting process. Among the areas with new language assistance requirements is Gwinnett County, Georgia, located in the Atlanta metropolitan area, which will be required to offer assistance in Spanish. From 2000 to 2007, according to Pew Research Center analysis, Gwinnett was among the top counties for growth of its Hispanic population. According to Census Bureau estimates for 2010-2014, 10,555 Hispanics in the county speak English less than very well, and 750 of that group did not have a fifth-grade education, out of 45,285 voting-age Latino citizens. Among the jurisdictions where language-assistance requirements were dropped was Salt Lake County, Utah, which no longer must offer ballots in Spanish. The county’s total Hispanic population grew from 12% of the total in 2000 to 18% in the 2014, the Center’s analysis found. Census data released to support the decision to drop Salt Lake County indicates that even as the number of Hispanic citizens of voting age rose since 2010, the number with limited English and low education levels declined. 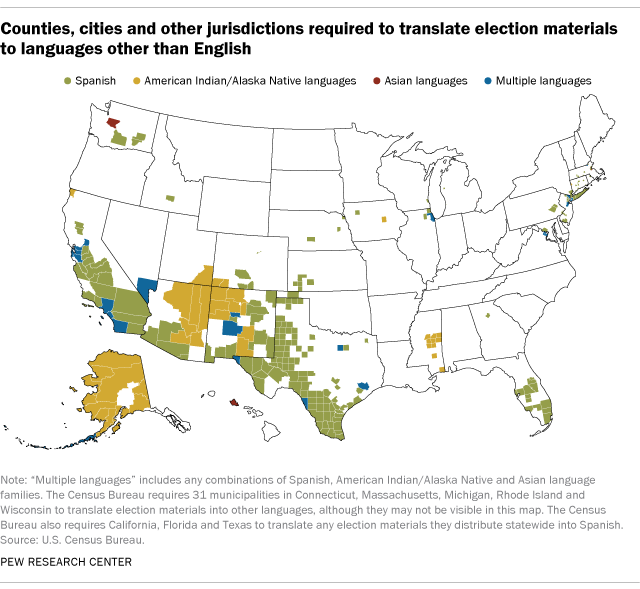 The language assistance required most often is in Spanish, which must be offered on ballots in 214 localities, according to the Census Bureau list, as well as on statewide material in three states. Gwinnett County is among 23 jurisdictions that have a new requirement to offer ballots in Spanish, and Salt Lake County is among 21 where the requirement was dropped. Ballots in specific Asian languages will be newly required in seven places, while an Asian language requirement was dropped in five others. In addition, 22 jurisdictions will be newly required to offer ballots in a specific American Indian or Alaska Native language. These include the Kodiak Island Borough in Alaska, which must offer elections materials in Yup’ik; Pinal County in Arizona, which must offer materials in Apache; and San Juan County, Utah, which must offer materials in Ute. The Justice Department has filed complaints against four jurisdictions in the past five years for alleged violations of the language assistance provisions, all of which led to consent orders or settlements, according to its website.